The wonderfully talented Helle Gade interviewed me on her blog. Please give it a read. Ben is an author of gnomes, plays, poetry and more. 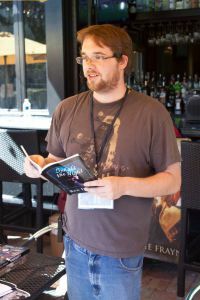 He was first published in his college publication and heads the poetry committee at the Mid-Ohio Fine Art Society. Currently, he lives in Marion, Ohio and is working toward his Master’s Degree. He loves historical documentaries and all things gnome. I mostly write poetry but I’ve been known to dabble in fan fiction and stories about magic Zeppelins. Have you always wanted to be an author/poet? Interesting question. I’ve always been writing (and sometimes scaring my elementary school teachers in the process). I know I’ve always wanted to be myself and make a difference, which writing seems to help. Tell me three things your readers might not know.